Largely influenced by its watery environment, visitors to Norfolk will find some superb attractions to enjoy. Norfolk is home to a beautiful shoreline; a given considering it is home to the world's largest naval base. The beach at Ocean View is a popular choice for those looking to take some time out, but there are many superb beaches to choose from. There are also some outstanding maritime centres, museums and nautical memorabilia shops on offer in the region, not to mention the mammoth navy base. 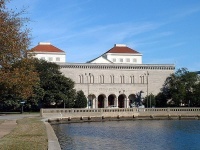 But belying its naval reputation, Norfolk is also home to a vibrant arts community, boasting a variety of dynamic art galleries, including the world-class Chrysler Museum of Art, numerous theatres and a grand opera house. The historic district of Ghent is a popular choice for those looking for something a little different. There are traditional wooden houses, tree-lined boulevards and old churches to see, all resembling the Norfolk of a time gone by. For lovers of history, antiques, art and architecture, this district is certainly worth the visit. Those in search of some fun after dark won't be disappointed should they stop over in the downtown area of Norfolk. Here great restaurants and chic bars can be relished long into the early hours. For more music and culinary fare, the Waterside Festival Marketplace is also a good bet for live entertainment and some great dining opportunities. From here travellers can also embark on a tour of the harbour and surrounding areas on an elegant tall ship or paddlewheel ferry.